3 color jumpy change R/G /B increase and decrease control. ✿Do not bend the strip light to a radius less than 15mm or bend it on a horizontal plane, and max length of each roll is suggested to be 5meters. Comes with a full 12 month warranty. Any problems with our products, please feel free to contact us. 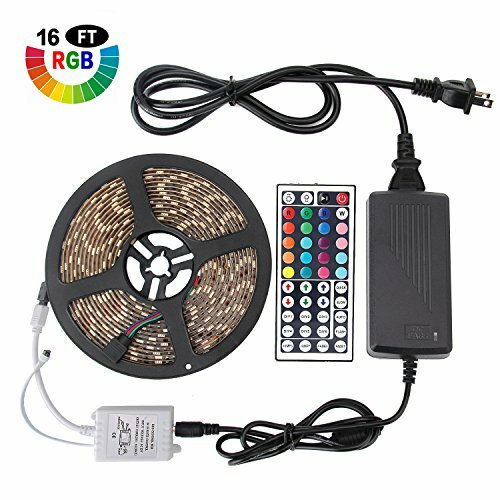 ✅All IN ONE KIT: Targherle 5M kit includes 1x16.4ft/5m IP65 Waterproof RGB Strip Lights with extra adhesive 3M tape, remote controller with 44 keys, IR controller, power adaptor and connectors. No more accessories are required. ✅MULTIPLE COLOR: A lot of color option. It can be changed color via the controller. Lights can also be changed in more than 100 different fading patterns, speeds and adjust brightness with the remote. You can reset color and press "FADE 7" on remote if some colors don't flash. ✅EASY TO INSTALL AND CUT: The multi-color changing LED strip lights can be cut every 3 LEDs along the cutting marks, without damaging the rest strips. Plug and play without wiring. Self-adhesive 3M tape is for secure and easy application for any clean, dry and flat surface. Please don't leave them on the spool for more than 2 minitues, otherwise it easy to lead to overheating. ✅SAFE and ECO-FRIENDLY: The working voltage is 12V, extremely low heat, which is safe to touch and no radiation, low carbon, no flicker, and no pollution to human and environment. It is touchable and safe to children. ✅BEST CHOICE FOR DECORATION: Decorate and light up any place with 5050 RGB SMD Strip Lights with dimming and brightness controls, suitable for indoor, outdoor lighting and decor. Such as dining room, bedroom, kitchen, under cabinet, garden, patio, balcony, party decoration, wedding etc. If you have any questions about this product by Targherle, contact us by completing and submitting the form below. If you are looking for a specif part number, please include it with your message.